The Federal Reserve on Wednesday lifted its benchmark rate by a quarter of a percentage point, the second hike this year. And a majority of policy makers said they now expect a total of four interest rate increases this year. Fed officials had been split about whether to raise rates three times this year or four. The decision reflected an economy that’s getting even stronger. Unemployment is 3.8%, the lowest since 2000, and inflation is creeping higher. The Fed is raising rates gradually to keep the economy from overheating. 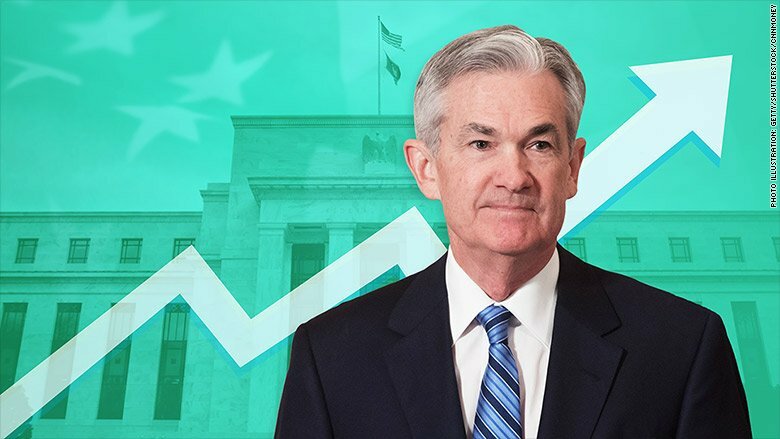 ”The main takeaway is that the economy is doing very well,” Fed Chairman Jerome Powell said at a news conference. “Most people who want to find jobs are finding them, and unemployment and inflation are low.” The Fed lifted the federal funds rate, which helps determine rates for mortgages, credit cards and other borrowing, to a range of 1.75% to 2%. “By just tapping the brakes more quickly, but not harder, the Fed is showing it’s willing to let the economy and the expansion run,” said Robert Frick, corporate economist with Navy Federal Credit Union. Mortgage rates have been climbing. The average rate on a 30-year fixed rate mortgage climbed to 4.66% this year in May, the highest in seven years, before falling slightly in recent weeks. Home mortgage rates tend to move with the bond market, but rates can also rise because of a higher federal funds rate. A higher rate makes it more expensive for banks to borrow money, which can translate into higher borrowing rates for consumers. In the bond market, too, investors are showing signs of concern about higher inflation and faster rate hikes. The yield on the 10-year Treasury note recently hit the highest level in almost seven years. The Fed’s decision Wednesday was driven by “indications that inflation is right around the corner,” said Jason Reed, an economist and finance professor at the University of Notre Dame’s business school. Inflation has been mysteriously low during the long economic recovery. But it has finally passed 2%, the level the Fed considers healthy. The Fed’s preferred measure of inflation, which strips out food and energy prices, climbed in May to 2.2% and registered the biggest annual jump in six years. The Fed expects inflation higher than 2% over the next two years, according to its latest projections. Powell said the Fed would be worried if inflation either persistently overshoots or undershoots the 2% target. He pointed out that inflation can “bounce around” over time, especially with a spike in global oil prices likely to raise prices. Powell said Fed officials are picking up concerns from business leaders about changing US trade policy. The Trump administration recently imposed steel and aluminum tariffs on Canada, Mexico and the European Union, and it is preparing tariffs against China. “I think it’s fair to say you’re beginning to hear reports of companies holding off on making investments and hiring people,” he said. Powell declined to comment on any specific policy, but he said Fed officials around the country are reporting concerns from businesses. “Right now we don’t see that in the numbers at all. The economy is very strong,” he stressed. “I would put it down as more of a risk.”Powell also announced that he plans to hold press conferences eight times a year, up from the current four. The change, which will take effect in January, will offer investors and the public more insight into the Fed’s deliberations and its view of the economy.